Unless you've just come out of hibernation, you have probably seen or heard something about the blockbuster movie and book, The Hunger Games. You may have already seen the movie or read the book. The Hunger Games is set in a futuristic, post-apocalyptic country where teenagers are randomly selected to participate in an annual, televised competition. Participants must fight to the death until only one contestant remains. According to IMDB.com, the movie had a first weekend's gross revenue of $155 million! At the time of this writing, The Hunger Games trilogy occupied the top four positions of top sellers at Amazon.com. Think about the projects that you are working on. Are there any that could benefit from a coordinated merchandising campaign? Using an online store like VistaPrint.com, you can build a table of products to give away or sell, depending on your situation. 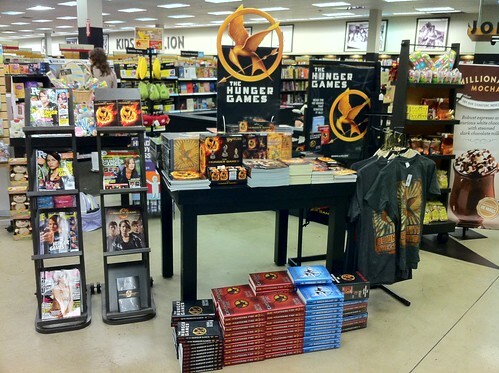 Check out a Hunger Games merchandise at a bookstore near you to get ideas. Remember to subscribe to the PersonalChange.info blog. You can also follow me on Twitter (@DouglasGPratt).